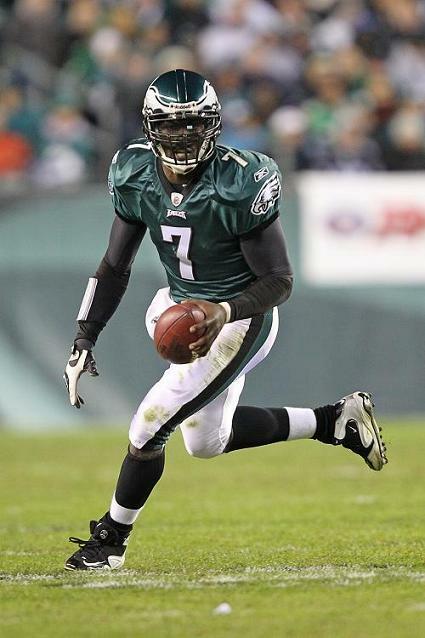 Vick came out of college early and the Atlanta Falcons traded for the first overall draft choice in 2001 to get him. Brought along slowly as a rookie, he displayed an outstanding throwing arm and quick release, as well as tremendous running ability, but also plenty of rough edges. Taking over the starting job in 2002, Vick passed for 2936 yards and 16 TDs, rushed for 777 yards with a league-leading 6.9 yards per attempt, and was selected to the Pro Bowl while the Falcons, coming off of three straight losing seasons, went 9-6-1 and qualified for the playoffs as a Wild Card. A broken leg limited him to five games in ’03, but Vick rebounded with two straight Pro Bowl seasons and the Falcons advanced to the NFC Championship game in 2004. While he became the first quarterback to rush for a thousand yards in 2006 (1039), his attitude and willingness to learn the fine points of his position came into question, and it all came crashing down when his involvement in a dog-fighting ring led to his suspension and eventual imprisonment – he was cut loose by the Falcons and missed two full seasons as a result. Signed by the Eagles to back up veteran QB Donovan McNabb in his return to pro football in 2009, Vick looked rusty and was typically used on Wildcat plays. With McNabb traded after the season, it was anticipated that Vick would back up Kevin Kolb in 2010, but when Kolb was knocked out of the opening game, Vick played well and was named the starter by Head Coach Andy Reid. Eagles went 10-6 to finish first in the NFC East while leading the conference in scoring (439 points) and touchdowns (49). Lost NFC Wild Card playoff to Green Bay Packers (21-16). The Eagles underachieved in 2011 and Vick suffered through an injury-plagued season, although he ended up passing for 3303 yards and 18 touchdowns and rushed for 589 yards, becoming the all-time rushing leader among NFL quarterbacks (5219 yards to date).